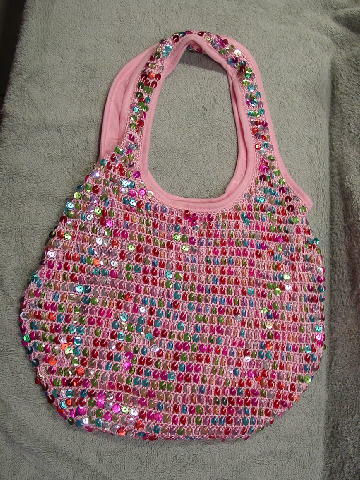 This light pink knit purse has a light pink see-through full lining. 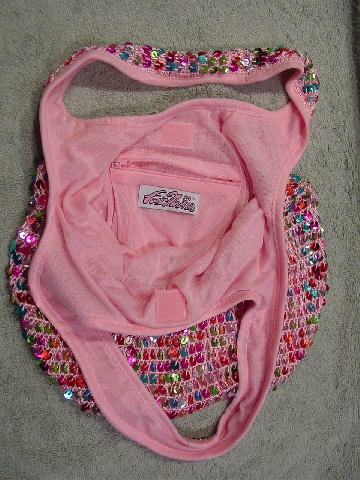 The exterior has magenta, green, pink, silver, gold, blue, and red sequins sewn on. The straps have a 3/8" wide solid pink fabric edging. There is a small zippered interior pocket and above it a small pink velcro closure. The lining fabric has some snags from the velcro side closures. The straps are 1 5/8" wide and there is a 10 1/2" drop.